Self reliance starts right in our backyards. Because you can never plan for every possible disaster scenario or survival situation, we’ve made it a point to help you get prepared by offering over 1,000 of our premium organic heirloom survival seeds for just $10. Simply add this starter pack to your shopping cart and they’ll be on their way to you within a few days. 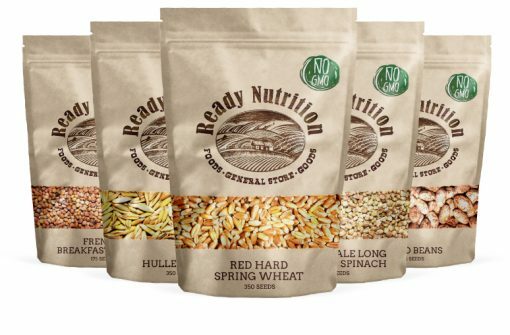 This Survival Seed Starter Pack contains five jumbo seed packets of key nutrient rich seeds that will provide essential food in an emergency. Our seeds are pesticide-free and contain absolutely no GMO’s! 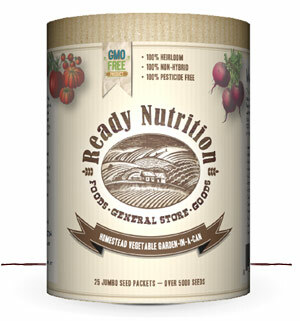 While these seeds will certainly provide your family with the sustenance you’ll need should disaster strike, we encourage you to consider upgrading to our Ready Nutrition™ Vegetable Garden In A Can. Containing over 5,000 seeds (including the five ‘Survival Seeds’ mentioned above) – enough to feed a family of eight for over one year – this kit can be used for spring, summer, fall and winter gardens and contains 25 different seed varieties. All it takes to get started is one Ready Nutrition Brand Homestead Vegetable Garden-In-A-Can, some good dirt, clean water, a healthy dose of sunshine and a little TLC every day! Before you know it, you’ll be up to your ears in fresh food — enough to feed up to a family of eight for a whole year! Our Vegetable Garden-In-A-Can contains 25 heirloom varieties and over 5,000 seeds (including the 'Survival Seeds' above) sourced through American farmers who have pledged to provide seeds free of pesticides and genetic modifications. Check our fact sheet below for more information.